Economic order quantity (EOQ) is the order quantity that minimizes total inventory holding costs and ordering costs. EOQ typically applies only when demand for a product is constant over a given period of time and each new order is delivered in full when inventory reaches zero. Other assumptions are that there is a fixed cost for each order placed, regardless of the number of units ordered. There is also a cost for each unit held in storage, commonly known as holding cost. Below is a graphical representation of how to find your economic order quantity across the different cost associations of ordering. The primary goal of economic order quantity is to determine the optimal number of units to reorder so that the total cost associated with the purchase, delivery and storage of the product are minimized. However, the primary goal of inventory optimization is to reduce inventory levels while raising service rates. Realistically, it is rare that many of the variables outlined above are constant and predictable. That is why continuous monitoring of order quantities, reorder points, pick frequencies and safety stock levels is critical to the success of inventory management and inventory control. Let’s focus in on order frequency for example. Determining order frequencies is one of the key variables of your supply chain. One way to determine a more accurate order frequency is to stay at the same number of annual orders but reallocate items between the A, B and C classifications, also known as ABC Analysis, while at the same time evaluate the demand frequency to more intelligently manage your order cycles and order quantities. This will help you more accurately marry the items you have in stock with the items you know you really need to reorder. Another effective strategy for lowering your on hand inventory is to purchase smaller and more frequent order quantities to reduce the overall inventory you carry or ‘hold’ in your warehouses. This will free up capital investment that can be allocated to other areas of the business. Can my warehouse and staff manage more frequent purchase cycles? Can capacity loss be offset by running lower demand parts less frequently? Will there be any loss of transportation efficiencies by moving to smaller batch orders? Smaller batch orders with higher frequency gives inventory managers more flexibility to align purchasing patterns with actual customer demand. 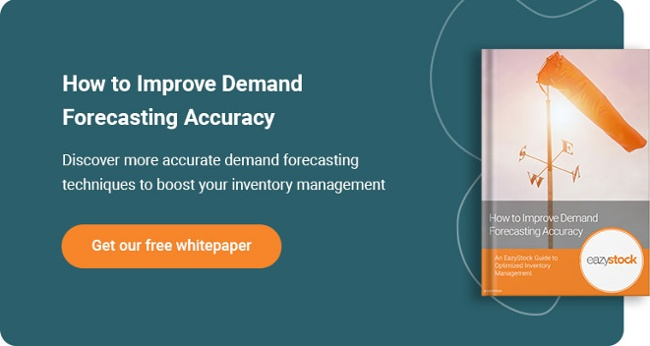 An important part of EOQ is demand forecasting; find out how to improve your demand forecasting accuracy with our free white paper!